Walk, Talk, Live Success -- I'm better than blessed because I am blessed by the best" said, Shakina Lewis-Small. She has mastered the delivery of strong messages to young audiences, as demonstrated by 12 years experience in traveling as a Speaker and Spoken Word Artist to different churches, schools, detention center, and organizations, conferences and various youth and young adult’s events. For her dedicated work with children and adolescents, she has been awarded many certificates of appreciation from various groups. Kina displays a unique style of reciting her poetry and is widely known for her inspirational parables and mottos. You won't find her confined to a microphone, but instead lovingly interacting with her audiences. Kina is fueled by a burning passion to teach young people to seek their purpose in God, often reminding her audiences "To give God your first fruits, your youth, God don't need your leftovers...serve God while you have a chance”. Kina displays her boldness and radical nature for God in many artistic ways, whether it is poetry, acting, songwriting, speaking, or just serving as a vessel of God to help people improve their overall health and promote the well being of the Christian community. Those who have experienced her performances know they can never be sure what she may say or do when she ministers. Shakina graduated with her Bachelor of Science Degree in Human Service from Center for Urban Theological Studies (CUTS). During her five year as a member, servant and Minister of Eagle’s Nest Christian Fellowship, Shakina is also a graduate of Eagle’s Nest Prophetic College, where she learned how to minister prophetically; she also served as the Youth Leader. Shakina currently attends Fellowship revival Church Of Love Apostle Leonard Willis. She currently works at Horizon House as an Employment Specialist & Case Manager, where she teaches life skills to high risk young adults and inculcate poetry workshops on how poetry and spoken word can be use as therapeutic tool to aid individuals with mental health and disabilities. She had learned “that your gift will take you but your character is what keeps you”. She performed in the hit play by One-Touch Ministry “Prayers of the Righteous Availeth much”. Her single “First Love” was in rotation on Gospel Highway 11 and WDAS AM, being the first spoken word artist ever aired on a local gospel radio station. Shakina is currently working on her album, which will prayerfully be released nationally. Shakina also published her writings through Johnson Publications poetry book Scribes in Stilettos. She also was the first spoken word artist to perform on Unity Day gospel stage in 25 years. Today, Shakina is busy training, teaching and raising up other poets/spoken word artists to identify and understand prophetic poetry. 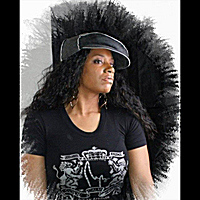 Shakina is also the Founder of K-Modulation, LLC "where words come alive" where she is one of the first who is pioneering a major platform for Christian Spoken Word Artists in the Philadelphia area through promoting spoken word competition and talent showcases. Shakina she has three children: Jasmine, Tatyana and Markel. She is married to Chase Sims singer and songwriter. Shakina also ministers to children that are in the foster care system by opening her home to those who are in need. Shakina states, "My poetry has one purpose. To convict hearts, convince minds and touch souls for Christ."